Miles Tea and Coffee have been sold at The Cheese and Wine Shop for over 15 years, and you can buy them online now for next day delivery! Miles is a traditional family firm, with a history going back over 100 years, and three generations in the tea and coffee trade. Miles use this expertise in all their Teas and Coffees for you to enjoy today. Miles dedicated team putting the Miles Teas through their paces... someone has to do it! 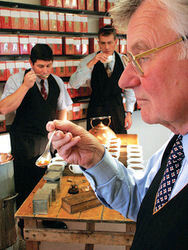 The company founded in 1888 by Henry Miles, the grandfather of Derek Miles the present Chairman. Miles teas are traditionally tasted and blended in Minehead, and Miles coffees are roasted on a daily basis at their Porlock site, just up the road in nearby Minehead.